For anyone listening to Edward Liddy's testimony, yesterday, the key statement of the hearings came at about 2:50pm. "It appears," said Rep. Jeb Hensarling (R-TX), "that AIG has become a conduit for counter-party transfers of taxpayer money." Amidst all the anger over the $165 million in retention bonuses gifted to AIGs derivatives traders, Hensarling focused attention on the next AIG scandal: counter-party payments. In all likelihood, the counter-party payments will make the retention bonuses look like loose change that fell between the couch cushions. Unlike the word 'bonus,' however, which has a crystal clear meaning in everyone's mind and requires no explanation, the phrase 'counter-party payment' means nothing unless it is defined. And that is a huge part of the problem: AIG in-house traders--let's just call them "gamblers"--gambled away trillions in company equity and assets using financial gimmicks called credit default swaps--unimaginably risky get-rich stunts that they marketed to investors, to the U.S. government and even to their own bosses as 'products.' When those AIG gamblers ended up on the losing end of all those gimmicks, having brought down the entire AIG corporation in the process, the result was a mountain of outstanding counter-party payments owed to other gamblers in other large corporations. Got that so far? AIG gamblers sat down at a table with gamblers from other companies, they made bets, AIG lost, and so AIG owes the other gamblers more money than most people can fathom. This is where the counter-party scandal at AIG really begins to take on monstrous proportions. If AIG had declared bankruptcy, a judge would have monitored all those counter-party payments, effectively telling all the other gamblers owed money by AIG to get in line, wait their turn, and be satisfied with whatever portion of payment the court allowed. The judge would have also berated AIG and every other company involve for turning a publicly traded company into a casino without rules. In monetary terms, a bankruptcy court would have forced the gamblers on the other side of the table from AIG to burden the share of the risk that they assumed when they walked up to AIGs credit default swap table at the casino and placed billion dollar bets, for example, on the U.S. housing market failing. It would have been painful, but it would have been relatively fair. Rather than allow AIG to fail, the Bush administration pumped more than $80 billion of our taxpayer dollars into AIG to allow the giant insurance-company-turned-big-stakes-casino to unload all its gambling debt. What that meant in real terms was that billions of taxpayer dollars were used to settle those counter-party payments with those other gamblers. So, who got the money? Today, AIG released the list of counter-party payments and--oh, my, dear, god. When the key points of the AIG counter-parties list finally sink in to the American population, there is going to be a run on torches and pitchforks at local hardware stores. 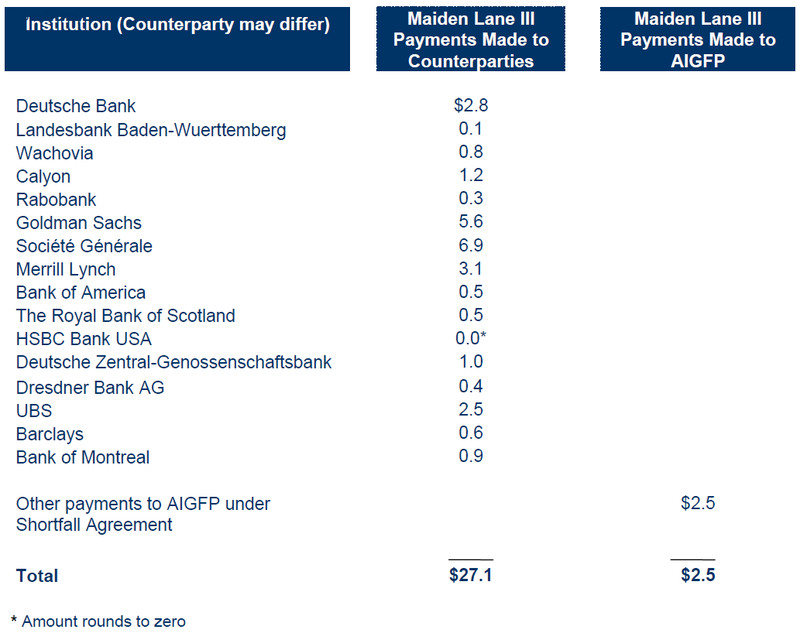 According to the list from AIG's press release, many of the largest counter-party payments were paid to gamblers in France, Germany, and the UK. When AIG received U.S. taxpayer dollars to prevent them from going into bankruptcy, they put $6.9 billion in a brown paper bag and gave it to gamblers at Société Générale--in France. Merci beaucoup! When AIG received U.S. taxpayer dollars to prevent them from going into bankruptcy, they wrapped $2.8 billion in tin foil and gave it to gamblers at Deutsche Bank--in Germany. Danke schön! When AIG received U.S. taxpayer dollars to prevent them from going into bankruptcy, they put $2.5 billion in shoe boxes and gave it to UBS--in Switzerland. Merci vilmal! Some of the biggest counter-party gambling debts U.S. taxpayers paid on behalf of AIG were to our very own Wall Street firms: $5.6 billion to Goldman Sachs and $3.1 billion to Merrill Lynch. In other words, while American taxpayers are rightly up in arms about $165 million in bonus payments to a few compulsive gamblers at AIG, we have not even begun to get angry about the $27.1 billion we forked over in counter-party gambling debts to foreign firms and Wall Street companies engaged in the exact same game of credit default swap Russian roulette as AIG. The reason the AIG bailout was structured so that taxpayer dollars would go towards paying off counter-party gambling debts is complicated. Before AIG failed, Lehman Brothers was brought down by its credit default swap gamblers. Rather than intervene to pay off Lehman Brothers counter-party debt, the Bush administration just let it collapse. As a result, all credit in the world froze. That was bad. When AIG failed, the idea was: try for a soft-landing of the company to avoid another systemic collapse in the financial market (e.g., like a run on the banks). Nobody knows for sure what that collapse would have been, but it would have been bad. So, instead of widespread panic and possibly a run on the banks when AIG collapsed, we ended up with truckloads of taxpayer cash being dumped into the coffers of compulsive gamblers in the U.S. and foreign companies--many of which will likely fail just like AIG. Remember when President Obama told us that things were going to get worse before they got better? This is it.